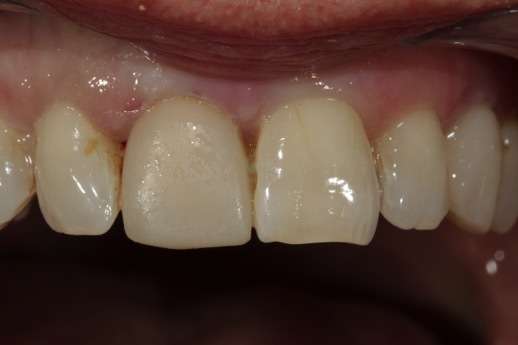 This upper right central incisor crown had been present for many years and shows the classic black line around the margin from the metal core within. 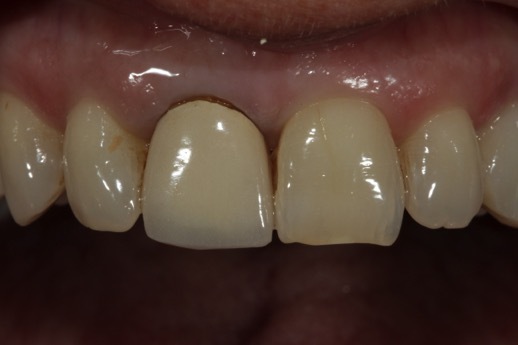 The crown was carefully removed to preserve tooth structure. 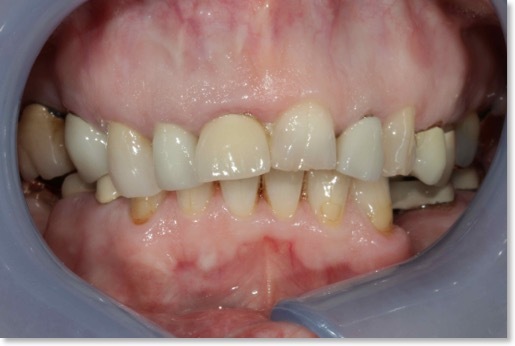 A temporary crown is fitted whilst the permanent crown is being produced. 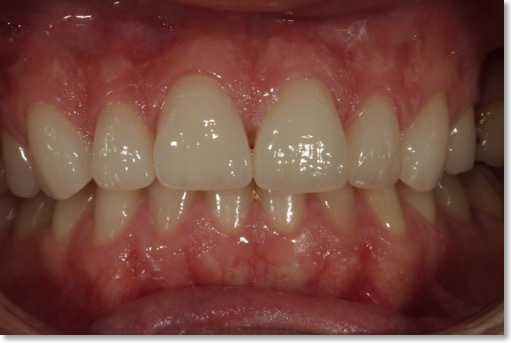 This patient is a fellow dentist that referred herself to me to have an old unsightly crown replaced. 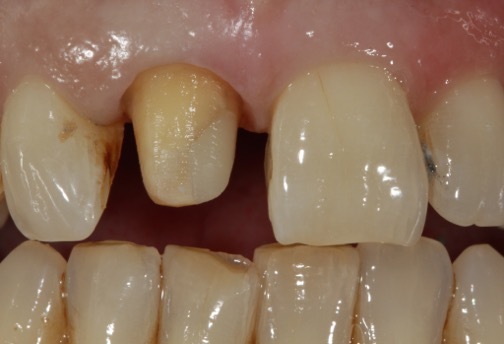 The tooth beneath had suffered trauma in the past and was root filled. 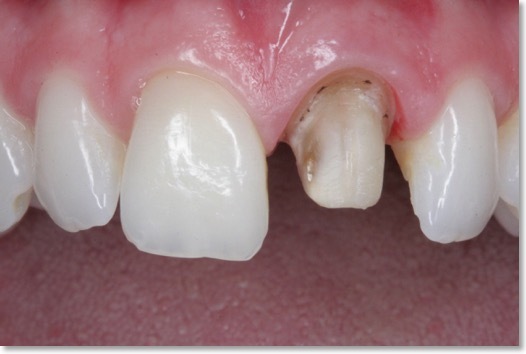 As with many root filled teeth the actual tooth structure was quite dark and the challenge then is how to mask that without it shining through the new crown. 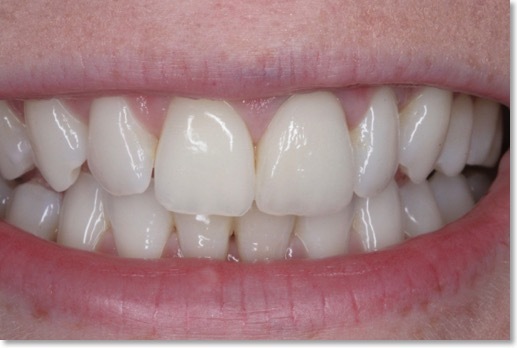 The After picture shows an Elite level all ceramic crown fitted. 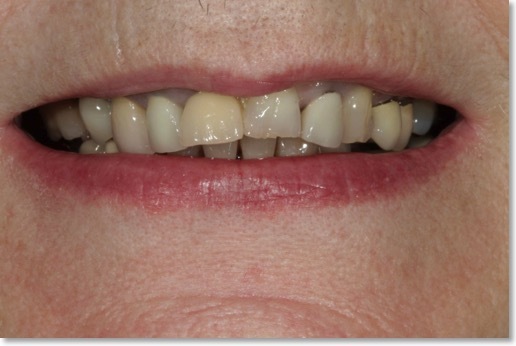 The upper front teeth had been traumatically damaged some years before and repaired at the time unsuccessfully. 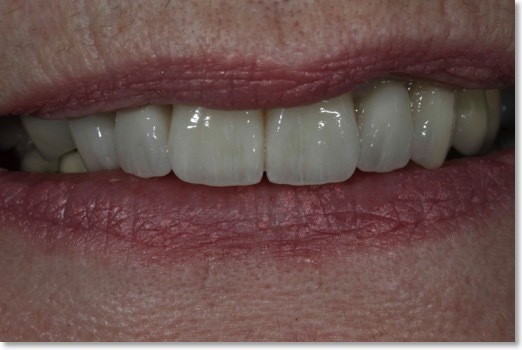 The patient wanted a durable cosmetic end result so a combination of cosmetic ceramic crowns and minimal prep-veneers were used. 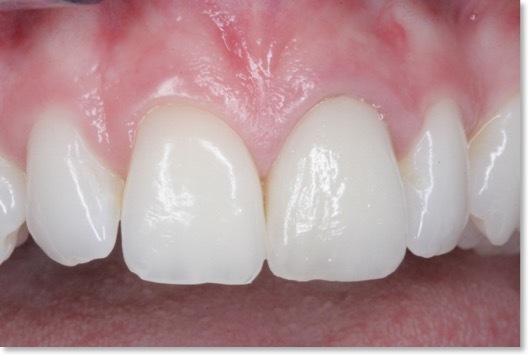 This shows the temporary crowns / veneers in place which were made from a diagnostic planning model. 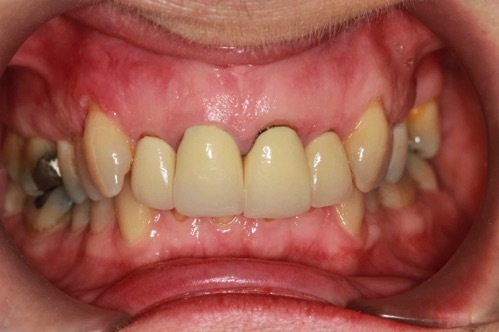 The patient wore these for around 2 weeks to ensure that he was happy with the change to the shape and size of the teeth. 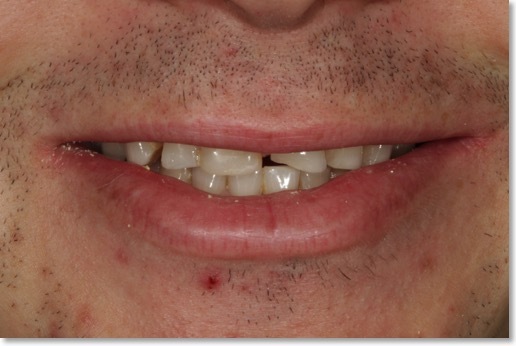 Changes can be made to these temporaries and then incorporated into the final work if required. 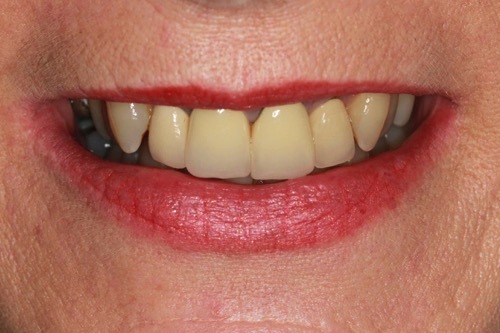 The characterisation of the crowns was chosen to be age-appropriate in this 70 year old patient. 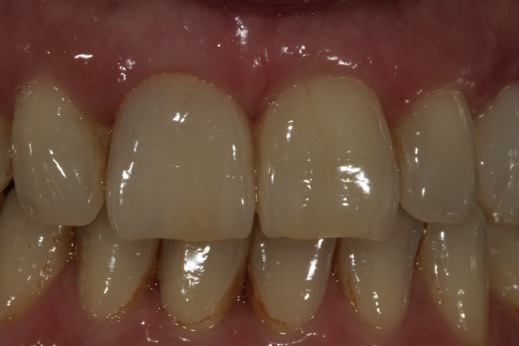 This patient had old NHS crowns showing a dull opaque look as well as black margins common with this type of old restortion. 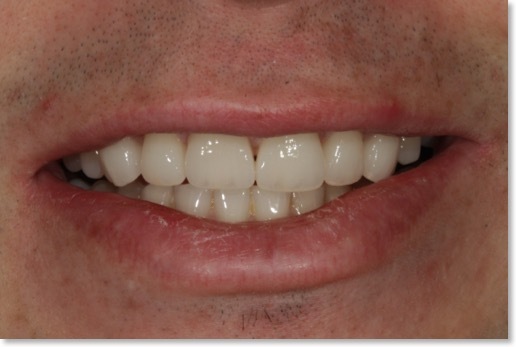 Planning models were produced to plan changes to the profile of the teeth and smile lines. 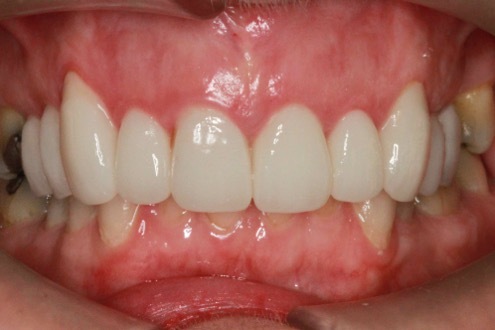 The final work fitted. 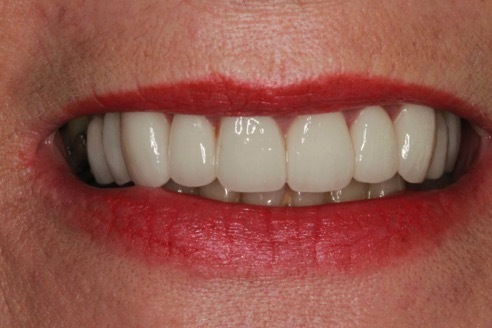 We opted for Elite level ceramic cosmetic crowns with mild characterisation. 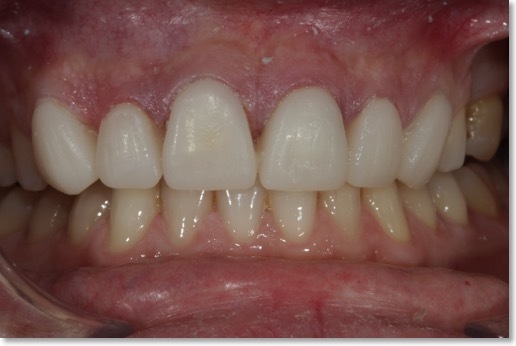 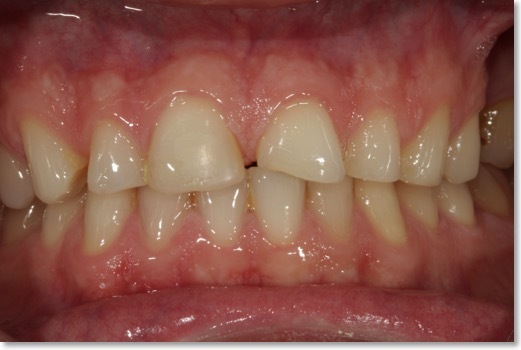 The patient chose a light shade and whitened the lower teeth . 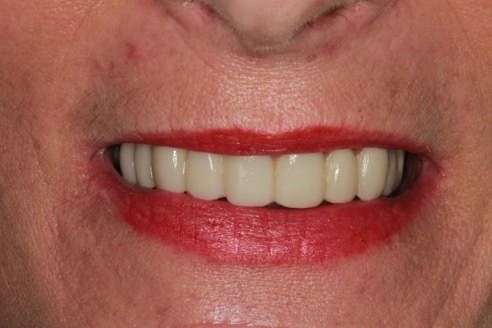 The trial smile demonstrated one shade option and this was modified to a lighter colour with the final work. 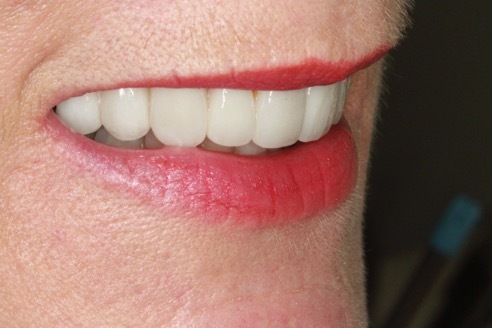 This side view shows how the tips of the new smile fit well with the lip being sat just on the vermillion border of the lower lip.